We know that those little toy boxes can be dark, messy, and thanks to those scratch and sniff stickers, a little smelly. So, you know what we think that toy box needs? It needs some glam! Naturally. Our Jessie Glam Costume can certainly spruce up any space, big or small! And because that little place was so confining, Jessie is now into going all-out, out here in the real world. 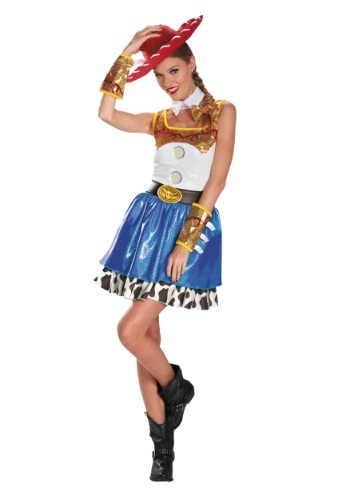 Which is why the lasso-ready look of everyone’s favorite Toy Story 2 cowgirl gets a lesson in luxe with this ensemble. Anyone can rope a steer (we can; can’t you?) and any decent daredevil can get Bullseye to ride like the wind, but only Glam Jessie can do it all in a skirt while looking smokin’. That’s a fact. So dust off your denim and stretch your cramped little toy legs at the dude ranch, ‘cause it’s time to get out on the town in this gorgeous glam getup! Add kickin’ cowgirl boots and our Glam Hat and Hair Bow Set to this look and you are 100% ready for a round-up of your crew. Remember them? Don’t be surprised if they do not recognize you in this metallic mega-glam dress with matching golden gauntlets. Change can be a hard thing to accept. Especially for small toy brains. But you know what they say? Think outside of the (toy) box! Onward and upward cowgirl!